The global market for veterinary drugs is consolidated in nature with several players operating in it across the globe, states a new market research study by Transparency Market Research. In 2015, the top ten companies operating in the global veterinary drugs market held a share of more than 70% of the total share. Some of the key players operating in the market are Elanco Animal Health, Merck Animal Health, Zoetis Inc., Bayer Animal Health, and Merial Animal Health. The rising commercial potential of the market and several lucrative opportunities in emerging economies are the key factors that are projected to enhance the level of competition among the key players in the next few years. In addition to this, the leading players in the market are expected to emphasize on fostering closer relationships with customers in the next few years, thus encouraging the growth of the overall market in the next few years. 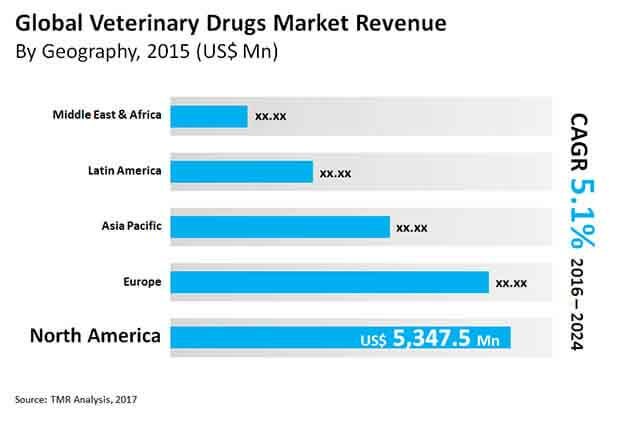 The global market for veterinary drugs has been categorized on the basis of geography into North America, Latin America, the Middle East and Africa, Asia Pacific, and Europe. Among these, North America is projected to experience a high growth in the next few years . As per the research study, this region led the global market in the last few years and is predicted to remain in the similar position throughout the forecast period. Furthermore, Europe is anticipated to experience a healthy growth in the next few years. Furthermore, the rising incidence of infectious disease among animals is expected to enhance the growth of the veterinary drugs market in Latin America and Asia Pacific. The rising popularity of a variety of companion animals and the growing demand for several meat products are considered as the key factors that are anticipated to encourage the growth of the global veterinary drugs market in the next few years. In addition to this, the growing disposable income of consumers, especially in developing economies has further allowed a significant rise in the expenditure on animal care, which is likely to accelerate the growth of the overall market in the near future. On the other hand, the entry of new products in the veterinary drugs market has resulted in a risk of counterfeit products, thus restricting the growth of the global market in the next few years. Moreover,the growing awareness among people regarding the adverse effects of some of the veterinary drugs on human is also estimated to curtail the overall growth of the market in the near future.